Raw food recipes don’t have to be boring, and a raw beet is a perfect vegetable to add vibrant color and healthy nutrients to even a simple dish of whole leafy vegetables. Most raw recipes are salads, but few of them include boring iceberg lettuce. Even then, a tiny amount of color – grated raw beet and carrot, or simply-cut vegetable and fruit – can create a drama in a dish adding a dazzling touch to any meal. 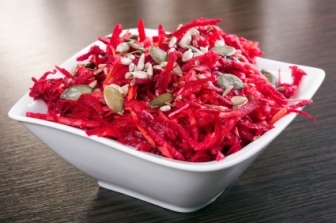 Try some of these easy-to-prepare raw recipes to introduce raw beets. If you are just exploring raw food diets, or merely looking to add more raw vegetables to your everyday menu, this quick raw beet salad recipe for beginners is easy to make. Simply grate some raw beets and carrots and add any ingredients from the suggested list. You probably have them already in your refrigerator or pantry. No fancy kitchen appliances or exotic ingredients required. Interested in trying a little more sophisticated raw recipe – a dazzling array of marinated veggies dressed with the golden honey-lemon vinaigrette? If you are not a 100% raw, try a spinach salad with raw beets and saffron rice for a deliciously nutritious, colorful summer dish. When preparing raw food recipes, hygiene in the kitchen is very important because the foods are not heated when being prepared (one of the advantages of cooking foods is it kills bacteria). Bacteria can quickly build up on the blades of a food processor, blender or juicer. These appliances will need to be cleaned thoroughly after each use. Some people get lazy about doing that, until they get sick. The health advantages of eating mostly uncooked foods may be numerous, but if you get a bad case of food poisoning, you won’t be able to enjoy the benefits. Scrub the root vegetables thoroughly before preparing raw dishes – after all they do come from soil. Raw food recipes that include nuts, seeds or grains typically call for an overnight soak. Soaking is believed to activate the enzymes in nuts and seeds. Grains like rice can be sprouted by soaking for longer periods of time. The only problem with sprouting is that it encourages the growth of bacteria. While some bacteria are beneficial, others cause illnesses. People who are already sick or weak have the greatest risk of developing a severe food-borne illness. Salads are not the only dishes requiring no cooking. Pickling is allowed in most diets, as long as the pickling is done at home using fresh foods. Pickled raw beets are delicious and very easy to make. You simply slice the beets very thin and cover them with apple cider vinegar. After marinating for about an hour, you will have pickled beets. Onions and cucumbers are other veggies that can be pickled in this way. It will take a little longer to prepare fermented raw beets, but unsurpassed health benefits of fermented vegetables make it worth your while. And, of course, the easiest way to introduce raw beets in the diet (and the quickest raw recipe to make) is to juice them. Take your pick from these refreshing beet juice blends .